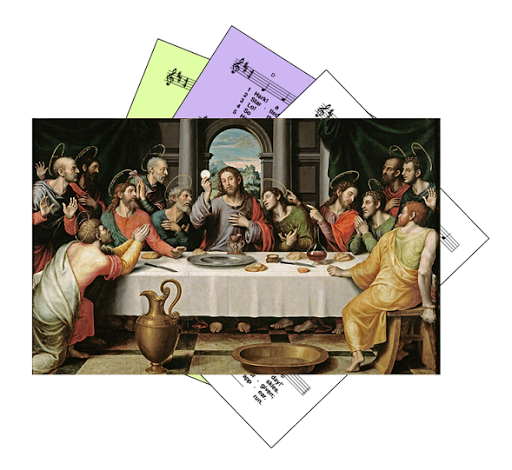 A selection of hymns and songs, based on themes from the Roman Catholic lectionary for Holy Thursday / Maundy Thursday - Mass of the Lord's Supper - which is the first ceremony in the Easter Triduum. Most are free-to-use (ie public domain or copyright-free), meaning the words can be copied and sung to at least one tune with no concerns about copyright or performance licensing. Many of these hymns are old/traditional - but where possible a variety of styles / genres are included. A small selection of hymns that are still copyright but are particularly suitable for the day are also included. This liturgy rememebers Jesus' Last Supper, washing the disciples feet and the institution of the Eucharist. It is also the first ceremony in the three-day Easter Triduum, which includes Good Friday and the Easter Vigil. First: Exodus - The Lord's instructions to Moses and Aaron about the Passover meal. Second: I Corinthians -The first Eucharist ... every time you eat this bread and drink this cup, you are proclaiming his death. Gospel: John - Jesus washes the disciples feet at the Passover supper. I faithfully refer to your website for every Sunday's hymns. And I v only heard from the priests and Congregation thanks for picking liturgy appropriate hymns. Thank you so much for the great help you provide with this website. God bless you loads.